How many times have you opened the pantry or fridge door and thought there's nothing to eat? This book is your saviour. Whether it's pasta or rice from the pantry or vegetables from the fridge, best-selling author Donna Hay will show you how to take everyday ingredients and turn them into delicious weeknight dinners. Donna is of the school that believes if you have an egg in the fridge, you have a meal on the table. So long as you have the versatile basics on hand, all you need to do is grab a few fresh vegetables or herbs on your way home and you have a quick meal and flavoursome dinner on the table. Divided into chapters according to ingredient - such as eggs, pasta, noodles and rice, chicken, beef, fruit and chocolate - simple dinners provides delicious, easy recipes to create at home. 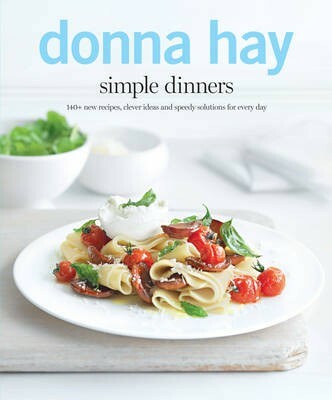 And no Donna Hay book would be complete without her signature tips and tricks, helping you get the most out of your ingredients. This book is proof that the simplest things are often the best. It will change the way you think about cooking.